One of the problems associated with naming ‘generations’ of filmmakers as with the ‘Fifth Generation’ in China, is that it becomes easy to forget that survivors of previous generations, such as Xie Jin were still making films in the 1980s and 1990s. The same problem arises with the naming of the ‘Sixth Generation’. This time, the basis for such a title is even more sketchy, compounding the potential for confusion. It is probably more useful to try to identify filmmakers in China today who have similar aims and who face similar constraints on what they can do. “The bicycle has always been an emblem of Beijing and even of China as a whole. For years it was the only means of transport for families. When I was young, the fact of having several bicycles was a sign that you were either wealthy or resourceful. Before China started opening up a family’s standard of living was evaluated by what were termed as the “Big Four”: a watch, a sewing machine, a radio and a bicycle. Today the Big Four are no longer the same . . . Although the bicycle has lost a lot of its glory it remains an important means of transport since there aren’t many motorcycles or cars. It no longer is the object that everyone wants to own but remains essential even if people wish to replace it. Unlike the sewing machine or the radio, it has gradually become a symbol of a lack of means. Guei, the courier, has a bicycle; for him it is the sign of social advancement and represents an important transition compared with his life in the village; Jian, although he is a student, comes from a poor family who still hold the bicycle in admiration, and for whom the purchase of a bicycle is a major decision. Jian’s love for his bicycle goes beyond his objective need for the object. His wish to possess it is motivated by his feeling of pride in front of this friends and his girlfriend. Wang’s film is typical of modern Chinese films – a co-production. The producer/writer is from Taiwan and the involvement of French companies helped get the film distributed outside China. In fact, the pressure to get a print out to the Berlin Festival in 2001, where it won prizes, meant that the film didn’t follow the correct procedures within China and was therefore banned until it could be resubmitted. Wang was dubbed an ‘underground’ filmmaker as a result (Beijing Review February 2004). This is ironic because, compared to a filmmaker like Jia Zhang-ke, who might well fit the title, Wang in Beijing Bicycle is drawing on ‘universal themes’ of classic international cinema, not least in his borrowings from de Sica’s Bicycle Thieves. He has had his problems with censorship in the past, but has also consistently worked ‘within the system’. Q What was it like going from being an underground filmmaker to being a commercial filmmaker? What was it like working on a co-production between Arc Light Films and Beijing Film Studio? Because he remained ‘official’ (at least before submitting the film) Wang was able to produce a film of high visual quality with impressive location shooting. In contrast, other Sixth Generation directors (sometimes also called the ‘Urban Generation’) have had to use cheaper technologies (digital video) and to develop shooting styles that are appropriate for low budgets and restricted operation. In this way, Beijing Bicycle shares a visual gloss with a film like The Little Chinese Seamstress (2002) made by an expatriate Chinese director, returning to China but working out of France, rather than the work of truly underground directors such as Jia Zhang-ke. The relative innocence of the young characters trying to live ‘normal’ lives in the hustle of rapidly developing Beijing can be contrasted with the ‘drifters’ in provincial Datong in Jia’s Unknown Pleasures or the film noir world of the characters in Suzhou River. Even so, there is a ‘down’ ending to the story which contrasts with the more upbeat, but equally ‘neorealist’ Not One Less (1999) from Zhang Yimou. 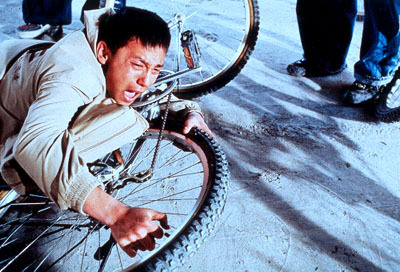 The narrative hook of Beijing Bicycle comes in the traditional humanist story of the two boys and their relationship forged through their desire for the bicycle, behind which is a more complex reflection on the potential social problems created by urban development and the threat to traditional forms of (family) discipline. Guei represents one of an estimated 100 million people who have left the rural areas to make lives in the big cities, where they are increasingly the subject of discrimination and prejudice. Guei is lucky to have a friend and protector who helps him because they share a common experience. The beautiful girl (played by current celebrity star Zhou Xun) also turns out to be a ‘country girl’ employed as a maid. Jian, although in a different social stratum, is still subject to the problems of city life. His family is not rich, but it is ambitious. His father has married again, so there are two children in the family. But Jian displays the symptoms of the social problems caused by the ‘one child’ policy of the 1980s, when the Chinese authorities sought to control population growth. In demographic terms, the policy was a success, but the social costs may be high. The generation of ‘only children’ is seen as having grown up as ‘spoiled’ by their parents. This means that they do not appreciate the value of things and are easily seduced by Western style consumer goods. As a result they get into debt and are incapable of living without the support of their parents – who they don’t necessarily respect. At the same time they are confident, assertive and intelligent (or at least well-educated) compared to earlier generations. Thus in Beijing Bicycle, Guei needs the bicycle in order to survive, but Jian needs it to show off to his friends (and his girlfriend) – he doesn’t understand its real value in social terms (and perhaps not the struggle that his father has had to raise the money which Jian has stolen to pay for it). Jian’s rather selfish actions lead to more pain for Guei. Perhaps the underlying criticism of Jian makes this a ‘political’ film? In fact the ending of the narrative is ‘open’ and could be read in a number of ways. Overall, although not directly ‘political’, Beijing Bicycle could indeed be provocative and it raises questions about how, or even if, the Chinese authorities can manage the shift to an increasingly urban society. The shift is taking place very rapidly. The film may already be out of date. 1. Can we distinguish the ‘universal’ themes of the film and the specific social issues of contemporary Beijing? 2. What do we make of the ending of the film? Is it in any way ‘critical’ of the authorities or ‘doubting’ about the future? This entry was posted in Chinese Cinema, Film Reviews. Bookmark the permalink.